My friend Diego Messina, long-time golf partner and world famous hairdresser (that’s correct), had one of the best lines to describe the popularity of golf 20 some years ago. Describing the allure of this game he simply said, “golf was the drug of choice in the 90s.” Right on, Diego, now give me a boys regular. It has waned somewhat for factors surrounding money (doesn’t it always ). Watching the Masters kinda brings it all back. I had one chance to plat at Augusta. Harry Sinden, one of my all time favorites, said he would take me. I said ok, let's do it. Then, at some point, I must have said something nasty about the Bruins, and he never brought it up again. The perils of wearing a microphone! It's sacrifice after sacrifice. What I'm going to tell you now is a true story. I don’t tell it often, but this seems like a good time to unload it. 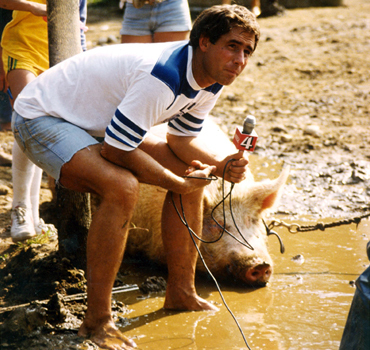 In the mid-80s I had an offer to go to New York and CBS to replace Brent Musburger. True. It was going to be hosting the Saturday college football scoreboard, but one could see it was a portal to potentially big stuff. #jimnantz. I chose to stay in Boston, Jim Nantz was offered the job, and the rest is history. In the course of the yearly sports cycle, these two weeks are basically the only time I ever regret my decision. The Final Four and The Masters would have been the prize, assuming I didn’t get fired. I always have maintained that we all made the right choice. CBS hired Nantz, and he has been the right guy, and will be for as long as he wants. I justify my decision to stay by simply saying I was too opinionated for a network, and probably wouldn’t have lasted a year. Remember the Harry Sinden story? It all worked out, except for these two weeks. I may get over it some day, but this is the state of the union today. These weeks are the busiest time of the year: The Marathon, Patriots' Day, playoffs (if the winter teams make it) and the Red Sox. People are already whining about the baseball team, and the target has moved from Pablo to Clay. No explaining necessary, but when David Price loses a game, it will feel like two or three loses. One more thing about golf, the drug of choice. I have already talked to a friend and club maker about cutting all my clubs to 6 iron length. There, that is the secret we all have been looking for! As soon as it dries, and I get my old/new clubs, let's play!